My birthday is coming up. So I’ve been thinking about something. I never get a birthday cake. (Ok, this is an exaggeration. I got a beautiful birthday cake that I still have dreams about sometimes from a wonderful friend last year. Hmmm… recipe to follow.) But before that, I hadn’t had an actual birthday cake in years. There was one sad incident when I made my own birthday cake. We won’t talk about that. But the more I think about it, the more I realize that I really don’t want a birthday cake. I’m just not much of a birthday cake person. There are a lot of other things that I’d rather have. Which brings me to a story. A baby-Christina story. Now, to hear my mom tell it, she has no clue where I came up with this idea. 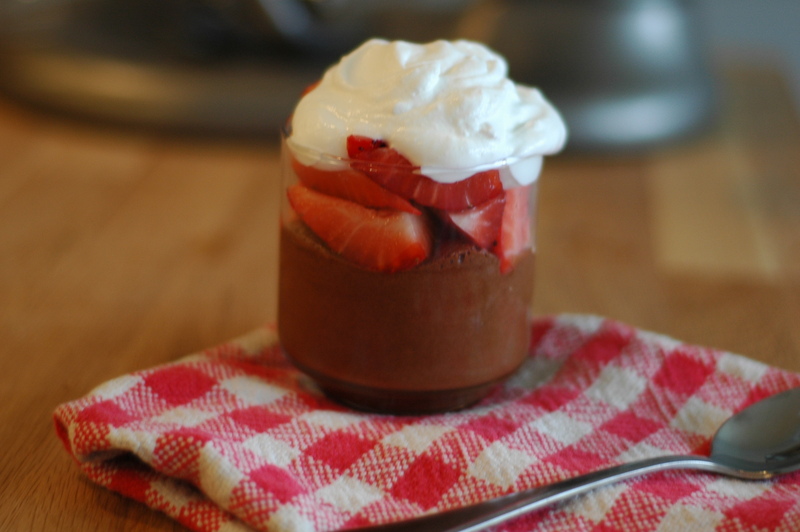 She had never made chocolate mousse, much less served it to her toddler. Blame public television, folks. The cookie monster must have had some mousse-filled cookies the day before or something. So after what I can only image must have been much stifled laughter, she did what any sweet, wonderful mother would do in her shoes. She went out and bought some snack packs of chocolate pudding and sent them along to school with me on my big day. God, I love her. All these years later, I still think I’d rather have chocolate mousse than birthday cake. This recipe from Pierre Hermes is probably my all-time favorite. It’s smooth and light, but the flavor is just like biting into a piece of dark chocolate. It makes a perfect dessert for company, but also is easy enough to justify making it as a little treat for yourself. I like to serve it in little juice glasses… it almost reminds me of a snackpack. A creamy, luscious entirely grown-up snackpack. Roughly chop the chocolate and place in a large bowl. Use a large bowl, so you won’t have to transfer the chocolate into a larger one later. No use in doing extra dishes, people! NOTE: There will, indeed, be a bowl of chocolate hunks in a bowl on your counter. Please try to avoid shoving them in your mouth. 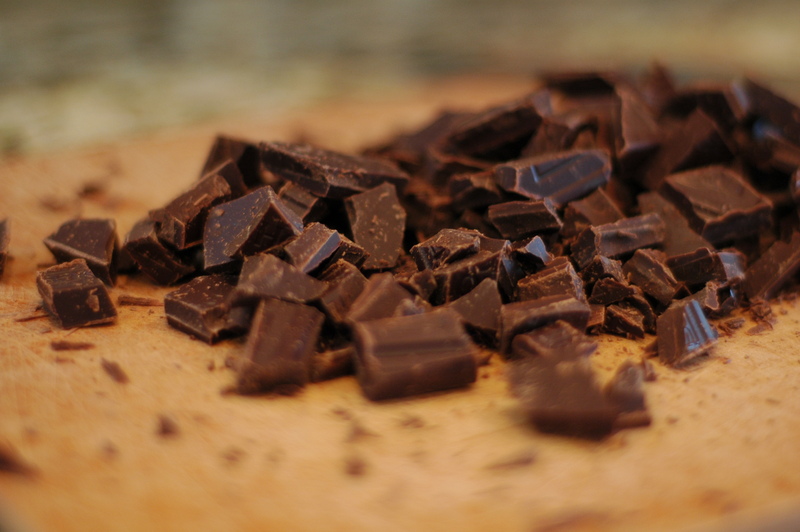 Heat chocolate until it is just melted- using the microwave oven is the easiest (just heat in 30 second increments until melted), but you could also use a double boiler. Set the melted chocolate to the side. It should still be warm to the touch when you use it. 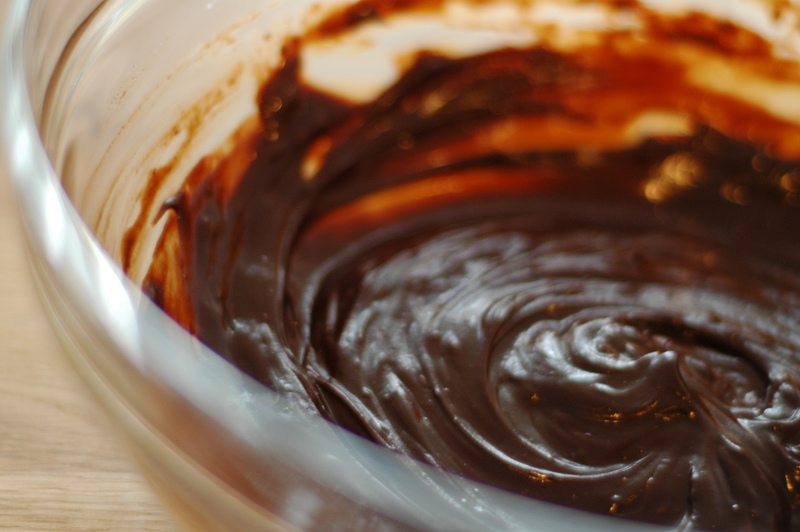 NOTE: At this point, there will be a large bowl of melted chocolate on your counter. Try not to stick your face into it. Bring the milk to the boil(in the microwave or in a small saucepan), then pour it over the chocolate. Using a small whisk, gently blend the milk into the chocolate. 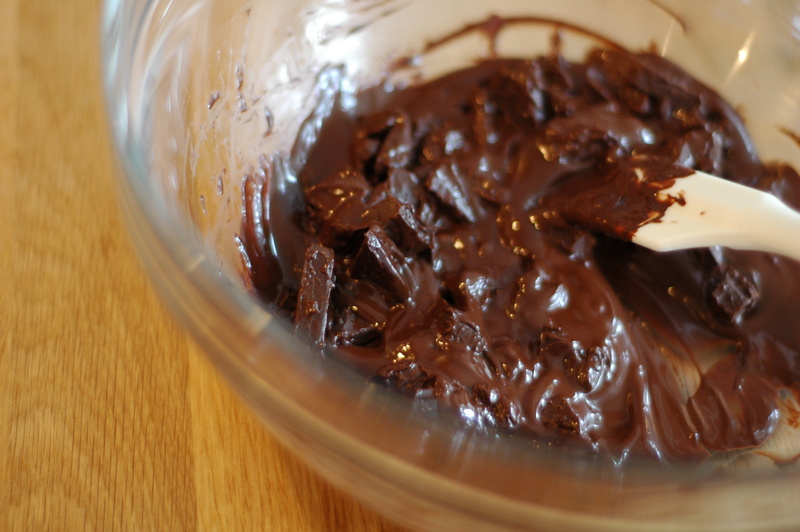 Add the egg yolk and whisk it into the chocolate, again working gently; stop when the yolk is incorporated.NOTE: This will make the chocolate look shiny and beautiful and ready-to-eat. Don’t eat it. 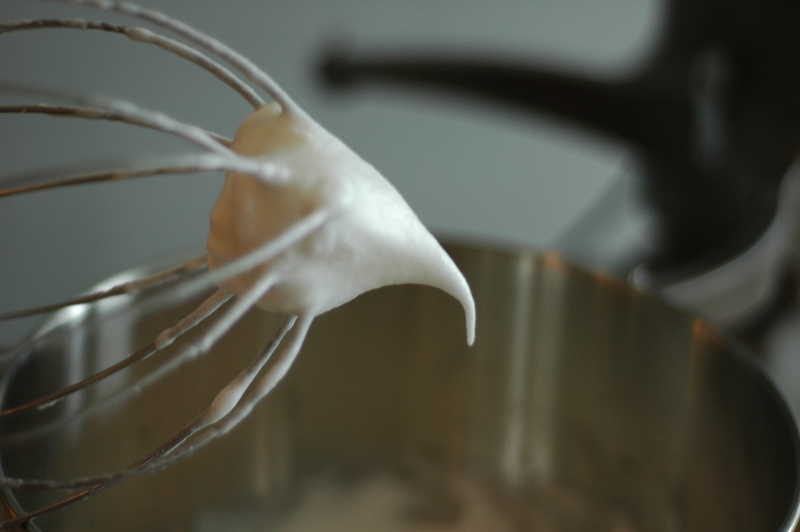 In a mixer fitted with a whisk attachment, beat the egg whites on medium speed just until they hold soft peaks. Increase the speed to medium-high and gradually add the sugar. Continue to beat the whites until they are firm but still glossy. Scoop one-third of the whites out of the bowl onto the chocolate mixture. 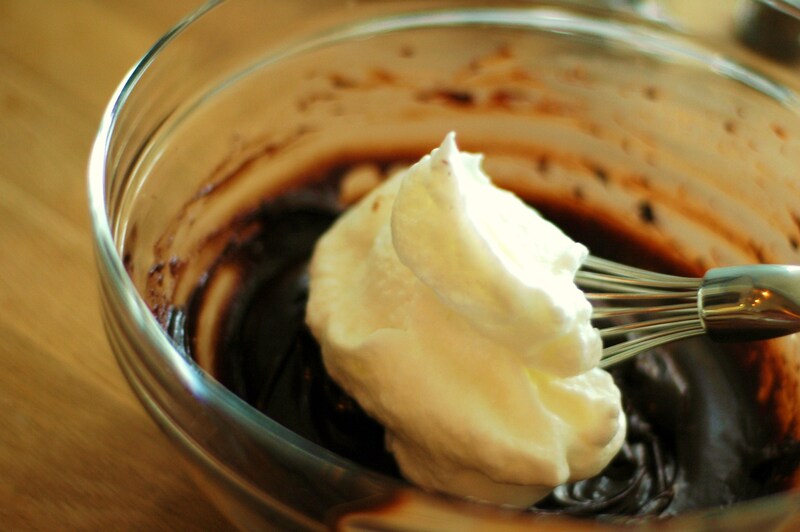 Working with a whisk, beat the whites into the chocolate to lighten the mixture up. Now, with a large flexible rubber spatula, delicately but thoroughly fold the rest of the beaten whites into the chocolate. 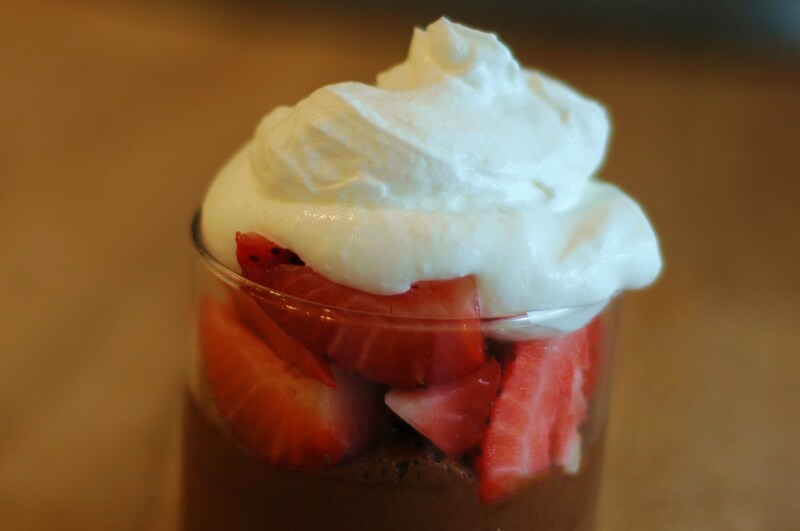 Turn the mousse into a large serving bowl or into individual glasses or cups, and refrigerate for 1 hour to set. 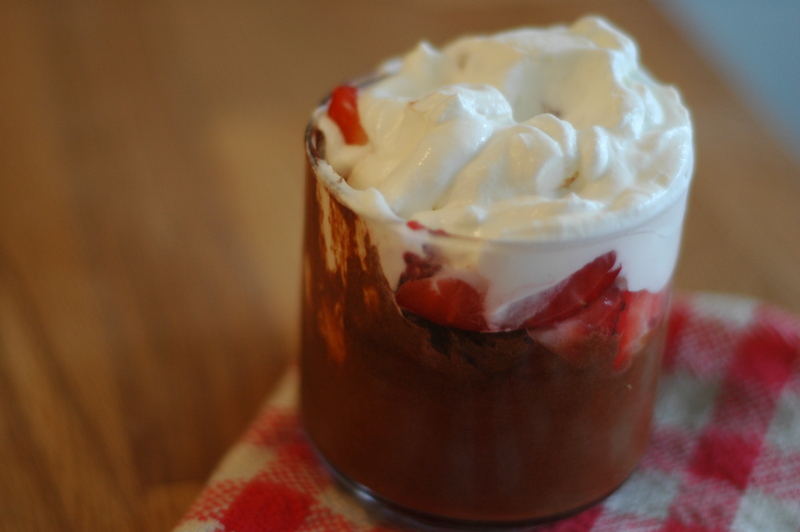 I recommend serving the mousse with some whipped cream and berries. You can eat this right away, or leave it in the fridge for a day or two. The mousse will be just as delicious, if a little denser. No harm there, right?